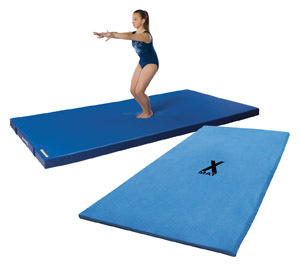 Gymnastic Mats - X-Mats & Throw Mats - Norbert's Athletic Products, Inc.
Cover consists of mesh breather top with 18 oz. coated vinyl sidewalls and bottom. 2" nylon webbing handles provided on sides and ends. All seams are double stitched with durable Dacron thread. Filled with prime 55 ILD polyurethane foam selected for its energy absorption properties. We sell multiple sizes to ensure you get the right one for your gym. Our Round Off X-Mats are specifically designed to reduce wrist and joint stress when practicing round-off entry vaults. Now with a beveled edge to reduce profile. Cover choices are the same soft denim material as our X-Mats or Performance Top material. Available in two sizes. Easily secures to your runway with hook and loop fasteners.